You can never have enough puzzle games on Switch. The latest is the safe-cracking, puzzle box game Access Denied. Does our reviewer think Access Denied cracks the code or will it live up to its name and deny itself access to recommendation? Access Denied is a 3D puzzle game developed by Stately Snail. The Russian development studio is known for such games as Shadow Of Loot Box and One More Dungeon. The development team consists of only two people who are very passionate about video games. Their first two titles were heavily inspired with 3D pixelated dungeon crawlers. Access Denied is their first game that features full high definition graphics. In a world where personal data is protected in specially designed storage boxes, it is your task to test the security of each storage box. There is no time limit so you can keep working on the boxes for as long as you like. There is nothing to distract you except the rain pouring outside. There are 36 different types of boxes to crack open, each with their own unique ways of opening. Some can be as simple as flipping a few switches or joining up the coloured lines. Other boxes have mechanisms that are much more intricate, to prevent you from getting your grubby fingers inside. Access Denied is a very much a single player experience. However, you could always pass the Joy-Con, Pro Controller or Switch console to a friend to see if they can do any better on the puzzles when you get stuck. The controls are relatively simple. The left joystick moves the cursor on the screen. The Right Joystick rotates the storage box on the screen. If the cursor does not move fast enough for you, you can adjust the speed in the settings menu. The A button is used to interact with the many knobs, switches and dials on each box. Sometimes you will have to hold the button down, to move the cursor in order to rotate certain parts. The X and Y buttons are used to zoom in and out. This is handy for when looking for hints or clues that are hidden on the body of the storage box. When fully zoomed out, you can see the background surroundings, which looks like the insides of a space ship. Access Denied is a game that uses modern 3D visuals and combines realism with that of science fiction. Quite a lot of attention has gone into the detail down to the screw heads on the panels. The visual effects are subtle yet nicely done. As regards to Music and sound, it is very limited. The background ambiance sounds like that of rain but also static. What is interesting about this, is that the environment that you are in looks like the insides of a spacecraft and yet, as far as I know, it doesn’t rain in space. At least, not water droplets. Meteor showers on the other hand is a possibility but I don’t think they sound like rain. One of the few other sounds is quite a familiar tone. When completing a stage, you will hear a computerized input sound (for lack of a better description). This sound has also appeared in Stately Snail’s Shadow Of Loot Box. I recognized it instantly as I reviewed that game as well. I found that the mechanics don’t always want to play ball sometimes. When trying to rotate dials, if you try to go clockwise, it will suddenly go anti-clockwise. It isn’t a huge hassle but it can be irritating at times. Some puzzles are extremely mind-boggling and others could not be any more simpler. Rather than a gradual difficulty curve, there does seem to be some relatively simple puzzles. Every now and again though, a curve ball comes out of nowhere just confuse the hell out of you. As with most games that released on Steam first, Access Denied is one of those games that has Achievements that can help players get points. This is not available in the Switch version, as the Switch does not have an achievement program in place. 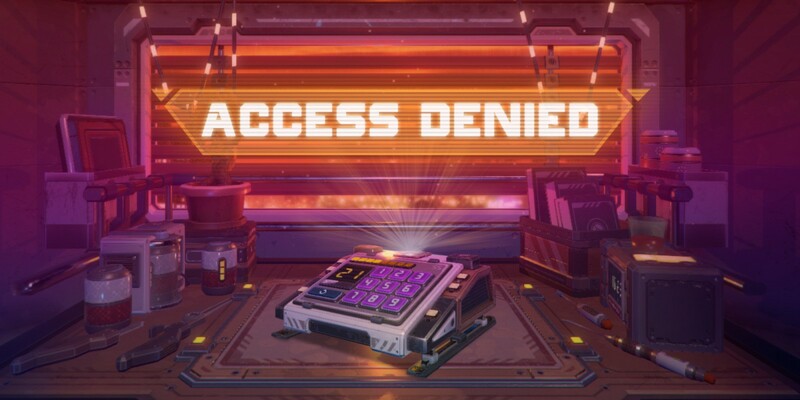 Access Denied is not a long game in the sense of gameplay. It instead relies on how long it takes you to complete a particular puzzle. Other than, to unlock other levels, progressing through each level feels like a chore. A lack of a leaderboards or time trial hinders any possibility of replayability. If you are looking for something to test the noggin and pass the time then for $4.99, you can probably take a chance on this game.